All of our Magickal Oils (Magical oils) are handcrafted with pure essential oils and blended in fractioned coconut oils. They come 1/4 oz. size. Scroll down for a quick reference on general uses or click on any oil listed below to find out about some of the special preparations involved in its creation and suggested uses. We have had 1 price increase in 19 years! We will be increasing the price of all our magickal oils to $12 on Sept. 1, 2018. 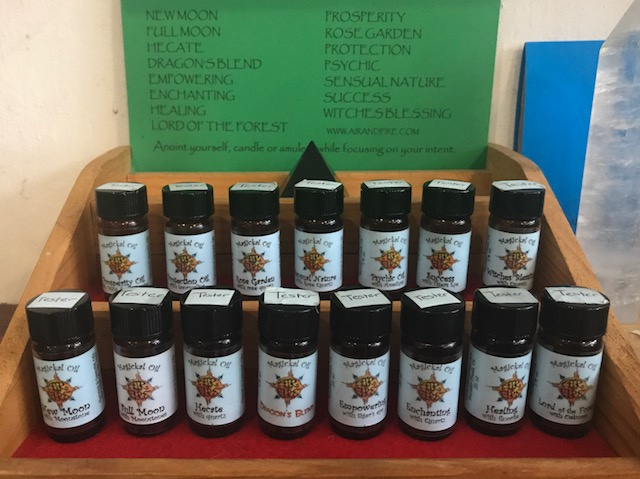 Guided by Spirit and imbedded with intent, we craft our Magickal oils (Magical Oils) in harmony with solar and lunar cycles to strengthen their purpose. Anoint yourself, candles or amulets while strongly focusing on your intent. Enchanting Oil- Use to allure, entice or assist outcomes in your favor. Our Magickal Oils are made from natural oils & ingredients from our mother earth and magickally prepared at key lunar and solar times with reverence and respect for the energies being worked with and strong intent to achieve optimum potency. Yet, we make no claims in it's effectiveness in your particular use.